You are here: Real Ghost Stories :: Poltergeists / Physical Manifestations :: Handprint Of A Ghost? This happened on September 23, 2018, around 10 A.M. Or so. It was a Sunday morning, and my roommate was at Service, so my cat and I were enjoying some uninterrupted TV time. I was enjoying a scary movie (my 'guilty' pleasure) with the drapes drawn and lights off for atmosphere. When out of nowhere, 3 loud bangs came from the wall behind me and to my right. Both the cat's and my heads whipped around to where the noise came from. Although, the room is dim, it is not dark at all, and there's nothing to be seen. Perhaps the slight tingly feeling I'd had was not movie induced after all, I thought to myself and said, "Hello?" aloud. I knew I was the only one in the building at the moment. The downstairs neighbors had gone to the city taking their dog with. So, it wasn't something they were doing. I went back to watching the movie, and again I hear "bam! Bam!" like someone hitting the wall flat handed. Again I stare at it. The other side of that wall is the bathroom, and it sounded like the sound originated from there. Off I go to investigate. The bathroom door opens inward, and I discovered what clearly appears to be a white handprint on the wall that's behind the door when opened. The same wall, I heard the banging on. It's in an illogical place; if you had your hand there, you wouldn't be able to open or close the door. It appears to be of the left hand, and is too large to be mine or the roommate's. An interesting note, is you can tell that at some point there had been a door there. You can see a faint outline where they hadn't filled it in properly with joint compound. The handprint is almost in the center of the upper half - where one would hit if trying the handle at the same time. I stared at what was undeniably a handprint for a long time. When you're on the toilet you face that wall, and I knew that it had not been there before. It was so white it stuck out like a sore thumb. I went and got my cell to snap a picture, before doing a more physical examination of the print that might alter it, or for all I knew it might even just disappear. While snapping the pic, I talked to the air. No responses though. Except for the coldness of the wall, there was no 'feel' to the print; slightly oily, or powder residue, etc. Didn't smear when I rubbed it either. Nor did I detect any emotion with it, at least none that might not be my own: a bit of nervousness, slight annoyance. Later, I easily wiped the print off using just a cloth a water - no scrubbing at all. So far it hasn't returned either, but then again this apartment seems to experience a lot of one off things. Yep, movie interuptous - how annoying! Hi Val, this is one of those experiences that makes me go 'huh, what'd ya know', because I'd have never thought to look for any marks on the wall. I guess I take for granted there's never going to be any 'proof' that anything remotely strange happened. But it makes you wonder what else ghosts might leave behind that we simply don't notice. As for ghosts and finger prints, the photo reminded me of something that I shared, actually the first thing I shared on YGS, about a dancing ghost. One of the things she may have done is left a hand print, or partial hand print, on the stereo. The print was in some dust that accumulated around sections where no one touched. It may have been left by anyone who came through the house. But it was an odd place to put your hand. We thought she might have tried to use the stereo while we weren't home. Anyway that hand print was kind of like your picture in that the finger tips looked kind of smudged or dragged, indicating some kind of movement. Bit rude of them to interrupt the movie. 'Yeah, you like scary movies do ya? What'd ya think of this' BANG BANG. What a numpty. Val - I agree it was probably a spirit making contact in it's own sort of way. This usually leaves us with more questions than answers. Many years ago my paternal grandparents stayed over for one night at a guest house. Just as they were dozing off, 'something' that felt like a hand started to squeeze my grandmothers throat. A print of four fingers and a thumb was burned into her skin. The doctors were dumbfounded and a photo of the mark as well as the report was kept in the hospital archives for some years. If it hadn't happened so many years ago, I would have tried to lay my hands on the photo and the report. Manafon - Perhaps I should firstly apologise to Val for taking her experience slightly off topic. I now find myself wondering whether, if I called in experts to take fingerprints of of my husband's cupboard (closet in America) where Vic hung out, would they have found prints besides those of myself and my husband? Hi Melda--I really have no idea if it's possible but it struck me that there are so many reports of apparitions (including one I saw) that look so much like living people, right down to the smallest detail, that it makes one wonder how far that detail could conceivably go. 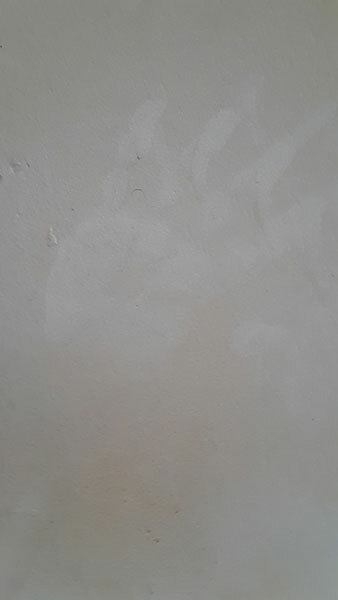 That a handprint can be left by a ghost is incredibly impressive but it makes one wonder if a handprint was left on a smoother, less pourous surface than a wall, if there might be fingerprints too. Ghosts in general are somewhat astounding, so whose to say how far their mimicking of human physiology might go. It's fun stuff to ponder! Manafon - What an interesting point you raised! However, although it probably was a deceased person, do you think that it is possible for a spirit to leave fingerprints? What do you think Val and others? I have my doubts but then again... Who knows? Val--Since apparitions commonly attempt to appear as "human-like" as possible I have often wondered if this extends as far as recreating detail down to things like fingerprints. I've read of handprints potentially left by spirits on walls and windows but frustratingly whether palm or fingerprints were left isn't mentioned. Think how cool it would be to match a print left by a spirit with that of a deceased person. Talk about compelling proof of the existence of ghosts that might impress even the most stubborn skeptic! If anyone here on YGS knows of a case where fingerprints have been left by a ghost please give us more info. Biblio! Good to 'see' you. Funny, I did have the same thought; perhaps long ago, 'he' was here when the door was there, and just couldn't understand why it wouldn't open. Of course, we'll never know for certain. Yeah, the timing of it, got me too. If it hadn't been for the banging, or the print, I would have just shrugged it off as a WTH moment, but coupled together it does make me go "Ummmm..."
A couple of minor things have happened since the handprint, but as I said before we tend to get a lot of one off things. "Someone" decided playing with the living room light switch might be fun for a bit, and then there was a small tray I keep in my room, decided to move to the living room. But nothing harmful or scary. It may just be my computer's screen, but the finger imprints look a little smudged downward and to the right, as though he slammed the wall in frustration, then pulled his hand down and away from the wall. If it was a simple "passing through" encounter, then the individual entity may have been in the house at some point in the past. My guess is that it was an intelligent haunt, to some extent, because of the reaction to the (past) door's refusal to function as a door in the present. Given that the supernatural has precedent for peculiarities in the perception of time, perhaps it could not easily identify the door's new location with any certainty. Usually, it's residuals that get caught up in their own little worlds, using devices, furniture, and doors that have long since been removed. Either way, that's a weird reaction to a bathroom wall. I'm really impressed with the clarity of the print, too. It looks like it took a genuine effort and focus to create that mark. Oh wow! That's really interesting that after what you described hearing, was what sounded like someone hitting the wall flat handed, and then to go see a hand print in the exact place that you heard that noise from, is just wow. Its timing was perfect to me lol as you were watching a horror movie, when it choose to do that to you 😁 I'd say this spirit has a sense of humor. Hopefully if it does stick around, it will at least give you privacy while using that bathroom. But at least it didn't seem to come off harmful or anything. Mostly just wanting attention, as I'd say it took its opportunity to play a little prank on you. RCRuskin, I've actually heard about that bus before as well. Not sure of the location I heard it was at, but honestly it seems a lot of those types of stories, are said to be in multiple different places. Like the cry baby bridge one, which I've heard is said to be at different bridges. Making it hard to know which location is the real one. But still, to think of the one you mentioned happening, makes you wonder the truth of it. I'd like to think it's true at least (only meaning that they would help the people that get stuck on the tracks), though heartbreaking for the people that lost their lives. Melda, yes, this was different. Actually I took the picture because I was so gobsmacked. Not too often you get physical proof that you're not imagining things. Manafon, I only noticed the 'normal' divisional lines you get with hand prints. I think that's what got me the most, how clear it is/was. No guessing to it. Do ghosts leave fingerprints? I don't know, but then I didn't know they could leave handprints either. Cuddlebear, we tend to get the odd noises now and then - not saying they're ALL paranormal, just odd, like hearing something like a framed picture skitter down the wall as it falls, with no picture involved. Or something like a plate smashing on the kitchen floor, but no plate. Just - odd. lady-glow, yes, it is a tad unnerving, but I don't have any sense of someone still being around in there. I did a cleansing just to be safe, so if it is still here, it must not be of the bad variety. RC, only 2 people use our restroom - me and the roomie. We did have exterminators in last April, and it is possible they used the facilities while I was out - but I think I'd have noticed it before now. Curious that it's white in color. I don't recall ever seeing one like that, that didn't involve powder. Val - Intriguing! All I can surmise is that this was a spirit passing through who wanted to attract some attention. I've had a few of those - they make their presence known once only, never to return again! I must admit though, I've never experienced physical evidence such as hand prints. A little different from your average ghostie just passing by to say hello. Hi Val--What a fascinating encounter. I've heard unexplained knockings on more than one occasion but to find a handprint really validates that something was trying to get your attention and that it wasn't the furnace banging or building settling. Nice clear handprint too. Can't really tell from the photo but could you discern any hand or fingerprints? It would be interesting to know if spirits can leave such prints. Thanks for sharing. So this is a tad freaky. As this happened in the Land of Lincoln, where I mostly grew up, I couldn't help but think of the hand print of Frank Leavy, in an old Chicago Firehouse. I hope the knocking doesn't return and I'm glad you were able to clean up the hand print. Someone not liking your taste in movies? Maybe play 'The Lost Skeleton of Cadavra' to see how they feel about it? Your experience reminds me of an allegedly haunted railroad crossing. Back story involves a school bus stuck on the tracks and hit by a train. Now anyone who finds themselves on the tracks at the crossing gets pushed across by some mysterious force, and the back end of their car will be covered by handprints. I've seen the back of my car, and it needs a wash. But besides that, it has hand prints all over it. Mine, parents, parking valets, etc. By size and shape it's fairly easy to tell what hand print is whose. Besides yourself and your roommates, who else uses the washroom? And do their handprints match the size of the print on the wall? © The ghost story Handprint Of A Ghost? is copyrighted to valkricry. Edited by yourghoststories.com.